C&G Partners is working on signage, architectural graphics and exhibits at the new Yankee Stadium, opening in April 2009. Today the Times ran an image of the main sign being installed (shown here) alongside an article about security at the last game. Caption: "Yes, they really are serious about it..." Photo by Librado Romero. 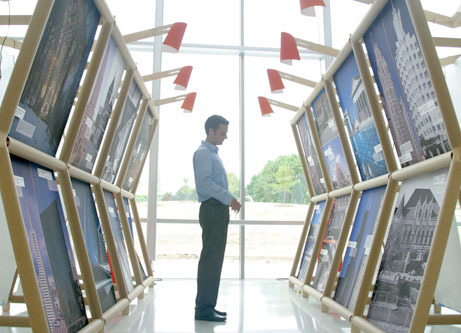 On the Road with "America's Favorite Architecture"
This month marked the end of the first full year of exhibition touring for "America's Favorite Architecture," the firm's traveling exhibit for the American Institute of Architects , shown below at the new headquarters of contract furniture maker Haworth in Michigan. The exhibit is still going strong, touring around the country. 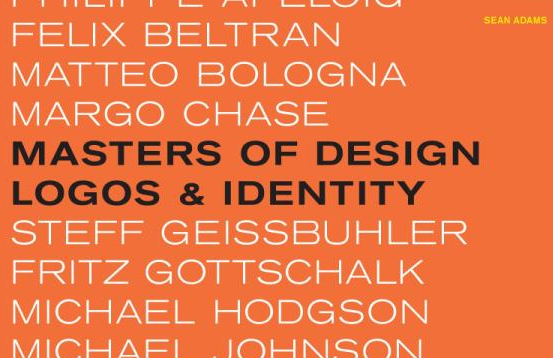 This week, Rockport Publishers released Masters of Design: Logos and Identity . The book profiles twenty well known designers, including C&G Partners co-founder Steff Geissbuhler . 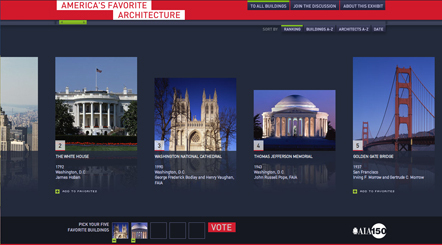 The profiles "are not only inspirational, but they provide real-world advice and support designers can use in their projects." The book was (well) put together by Sean Adams and Noreen Morioka of AdamsMorioka . Steff Geissbuhler was just interviewed in TAXI. In the interview, he shares some of his philosophy about branding, design, mergers and a few other things. Along the way, TAXI kindly calls Steff "one of the industry's most established veterans on branding" and suggests that he has been "helping to 'invent the entire category' of corporate identity."